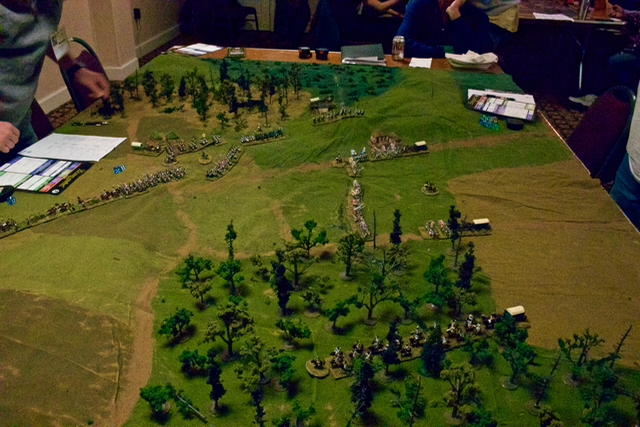 We've posted photos and brief AARs of our second and third ESR Napoleonic games at Cold Wars 2017 to our Gallery. Played in the first game on Friday. Had a good time and Dave the rules author is a good and patient GM. Nice looking game table. Is the cloth purpose-built for a specific game, or can it be changed? I agree about the clutter, but it is inevitable – though the drinks would make me real nervous. Not like we have extra tables behind us for boxes and stuff. RetroBoom – Glad to hear, hope we can get you into one at the next convention, they do tend to fill, so I greatly encourage pre-registering. Our convention schedule is on our website. 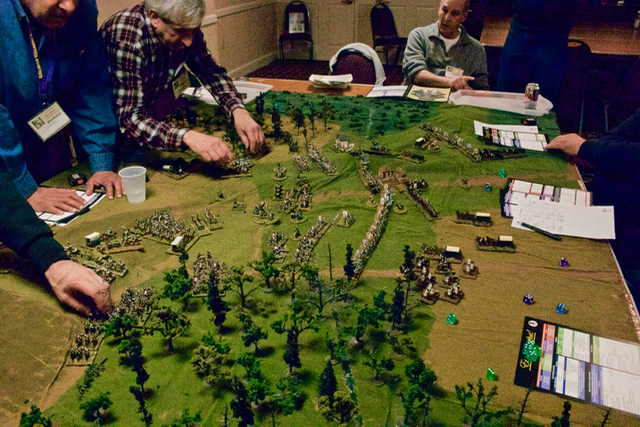 Toronto48 – While I would prefer we had the luxury of side tables for beverages, dice boxes and charts, what is most important is that the players have fun. And as we were running learning games, having the "tools" as accessible as possible becomes a compromise driver. As to drinks, there isn't much one could spill on the terrain cloth that wouldn't make it look like another variation of earth tone, so we accept the risk. Tom D1 – Thank you, one never knows how they are doing GM'ing while they are doing it, we just cross our fingers and hope! Very glad you had a good time and look forward to seeing you at the next one! history gamer – Thank you. The cloth in question is actually for the Battle of Vitebsk in 1812, but frankly, it is a map with a river on one edge, a couple small streams, and two roads which criss-cross creating a cross roads in the center – meaning that by moving around where you place hills, woods, and villages, it can represent darn near anywhere, at least generically. We have two that we overlay in a diamond pattern to create the battlefield 1812 Loubino battlefield. I really liked seeing the games.. took pics myself! I also like the company that goes along with this!!!! The color plates are invaluable! Poniatowski – Thank you. We try to make the sorts of products that we wish existed.